Back in March, Team Pantheon’s Reid Duke — a known Legacy Pox player — developed his personal take on Modern’s discard deck 8Rack. You can see his list below. The Tron match is improved a little thanks to Smallpox, but not nearly as much as we’d like. Some number of Surgical Extraction would help with this (and with other matches). Smallpox as a 4-of is just too much, even with 24 land. Either we need to increase the land count, or drop the Smallpox count. 4 Mutavault is too much. I knew this going in as I used 4 for months before finally doing the math and seeing clearly how greedy it is (which was in line with my own experiences). It’s not always needed or useful anyway, so I don’t feel too bad about trimming one. The lack of Ensnaring Bridge is felt very obviously and harshly many times. We absolutely need it or Damnation. The flexibility of Dismember was great in these matches, but especially as a 4-of, it would be brutal vs Burn, which is currently sitting pretty atop the meta at 9.2% (9% for MTGO alone), and Affinity (7%). No Dakmor Salvage is a mistake. With a Raven’s Crime in hand, this is a Lily +1 when we don’t have Lily, and a double activation when we do. Persistent discard is extremely important. The sideboard proved interesting and useful at times. I’d like to try it a lot more to get a better feel for it. Waste Not sideboard is something I’ve always approved of; Night is a card I’m glad we can use in this version (in mine it’s too expensive). So, to summarize, I vastly prefer the stock mainboard, but there could be something to the sideboard, if only a piece or two. One thing I like about this version’s sideboard is Curse of Souls’ Betrayal. With Delver everywhere and elves making a major showing online as well, it’d be nice to have a more permanent way to deal with x/1 critters from decks that have reliable means of removing bridge. Betrayal fits that nicely. 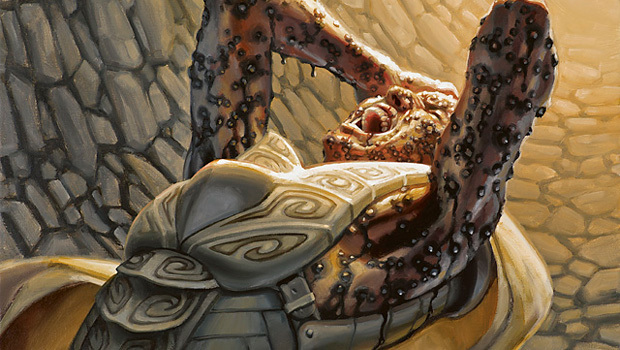 Bile Blight can deal with either delver, pyromancer or pyro tokens, but not all three, just like it can deal with either elves, but not them all.